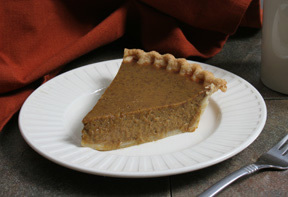 Enjoy the great taste of pumpkin pie without having to make pie crust. 1 can pumpkin - 15 oz. In a large bowl combine the cake mix, egg, and butter. Mix well with an electric mixer. Pat into a 9 x 13 pan that is lightly greased. 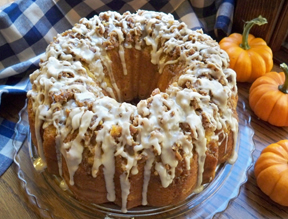 In another bowl, beat the cream cheese and pumpkin until smooth. Add the eggs, vanilla, and butter. Beat together. Add powdered sugar, cinnamon, and nutmeg. Mix well. 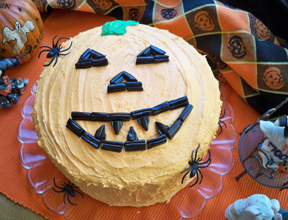 Spread pumpkin mixture over the cake batter. Bake for 40 to 45 minutes. Make sure you do not over bake. Center should be a little gooey. 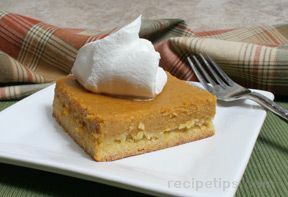 "I hate making pie crust so this recipe was a great way to satisfy my craving for pumpkin pie. It was easy to make."